Terriers received goals from each of its four lines and a 31-save effort from Sean Maguire as they defeated Northeastern, 4-2, at Matthews Arena. Despite the win, BU remains in fifth place as Providence upended Lowell to move into a first place tie. BU needs to win tonight’s regular season final and a loss by Providence, BC or UNH to earn home ice in the Hockey East playoffs. In the tightest race in many years, six teams are separated by just three points. BU got on the board midway through the first period when senior Jake Moscatel (photo) corralled the rebound of a shot and calmly deposited it for his first career goal. Wade Megan’s 15th of the season on a shot that squeezed through the Northeastern goalie’s five-hole made it 2-0. The Huskies narrowed the lead when an offensive zone turnover led to a score with just two seconds left in the period. After a scoreless second period, Danny O’Regan, who earned first-star honors, deflected home a Matt Nieto pass early in the third and three minutes later Matt Lane took a slick pass from Cason Hohmann, went wide left and beat the goalie short-side and high for a 4-1 lead. Northeastern took advantage of a fortuitous bounce off the endboards to make it a 4-2 game but that was as close as they would get. The victory came with a hefty price as junior defenseman Garrett Noonan suffered a shoulder separation in the second period and may need season-ending surgery. He’ll be replaced in the lineup tonight by junior Matt Ronan. Ryan Santana had a pair of assists and now has seven points in the past seven games, including three multiple-point games. He became the eleventh Terrier to reach double figures in points this season. With their assists, Nieto and Hohmann each reached the 30-point mark. Moscatel, who last scored in a college game while playing for Division 3 University of New England, is a senior, but has a year of eligibility left and hopes to return next season. 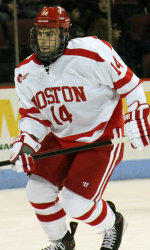 ► Tonight's game against Northeastern at Agganis Arena is Senior Night and will air on Terrier TV and WWZN Radio. Puck drop is at 7 p.m.
2013 recruit Robbie Baillargeon scored his 18th goal of the season in Omaha’s 6-3 loss to Tri-City. 2013 recruit Doyle Somerby, who made his USHL debut last night for Muskegon in a 5-2 loss to Lincoln, was named to USHR’s All Prep East Team. He had captained Kimball Union Academy this past season. Also making the All-Prep East Team is Trevor Fidler, whose father Mark Fidler led the 1978 NCAA Champion Terriers in scoring. Colin Wilson notched a career-best four points, with a pair of goals and two assists in Nashville’s 6-0 blanking of Edmonton. Video. With a 7-12-19 line, Wilson leads the Predators in scoring. Eric Gryba’s slap shot led to the game-winning goal as Ottawa edged the Rangers, 3-2. It was his third assist since his call-up from Binghamton. Adam Clendening’s goal with two seconds left in regulation pulled Rockford into a 3-3 tie with Oklahoma City and the IceHogs won, 4-3 in a shootout. It was the former BU defenseman’s sixth goal. Corey Trivino scored his 112th goal and added two assists as the Florida Everblades doubled up Ft. Wayne, 6-3. #4 Terriers take on Providence in the Hockey East tournament semifinals today in Hyannis, Mass. Puck drop is at 12:30 p.m. The winner meets the victor of BC-Northeastern in the title game Sunday. The top-seed Terriers are seeking to defend the conference title they won in 2013. Hockey East announced its all-star teams at its annual banquet. Juniors Marie-Philip Poulin and Shannon Doyle were selected for the first team, senior Jennelle Kohanchuk was named to the second team and senior Isabel Menard received honorable mention.